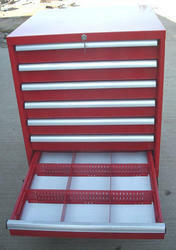 Manufacturer of a wide range of products which include cnc tool trolley. Supported by our hardworking professionals, we are also engaged in the manufacturing, wholesaling, dealing and supplying of CNC Tool Trolley. The offered cabinet is manufactured using the best quality raw material and modern technology in compliance with industry norms. A team of quality examiners test this cabinet on various parameters, before the final dispatch. In order to cater the demands of the customers, we offer this cabinet in various sizes and designs.